George VI (Albert Frederick Arthur George; 14 December 1895 - 6 February 1952) was King of the United Kingdom and the British Dominions from 11 December 1936 until his death. He was the last Emperor of India (until 1947) and the last King of Ireland (until 1949). As the second son of King George V, he was not expected to inherit the throne and spent his early life in the shadow of his elder brother, Edward (known as David to his family and close friends). He served in the Royal Navy during World War I, and after the war took on the usual round of public engagements. He married Elizabeth Bowes-Lyon in 1923, and they had two daughters, Elizabeth (who succeeded him as Queen Elizabeth II) and Margaret. At the death of their father in 1936, his brother ascended the throne as Edward VIII. Less than a year later Edward VIII abdicated to marry the twice-divorced American socialite Wallis Simpson. The British Prime Minister, Stanley Baldwin, had informed Edward that he could not marry Mrs. Simpson and remain king. 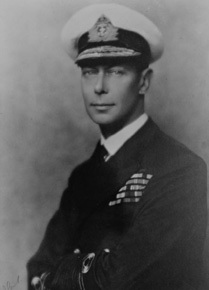 By reason of this abdication, unique in British history, George VI ascended the throne as the third monarch of the House of Windsor. Within 24 hours of his accession the Irish parliament (the Oireachtas) passed the External Relations Act, which essentially removed the power of the monarch in Ireland. Further events greatly altered the position of the British monarchy during his reign: three years after his accession, the British Empire was at war with Nazi Germany. In the next two years, war with Italy and the Empire of Japan followed. A major consequence of World War II was the decline of the British Empire, with the United States and the Soviet Union rising as pre-eminent world powers. With the independence of India and Pakistan in 1947, and the foundation of the Republic of Ireland in 1949, King George's reign saw the acceleration of the break-up of the British Empire and its transition into the Commonwealth.